North Atlantic Books, 9781623170981, 248pp. Igniting a long-overdue dialogue about how the legacy of racial injustice and white supremacy plays out in society at large and Buddhist communities in particular, this urgent call to action outlines a new dharma that takes into account the ways that racism and privilege prevent our collective awakening. The authors traveled around the country to spark an open conversation that brings together the Black prophetic tradition and the wisdom of the Dharma. Bridging the world of spirit and activism, they urge a compassionate response to the systemic, state-sanctioned violence and oppression that has persisted against black people since the slave era. 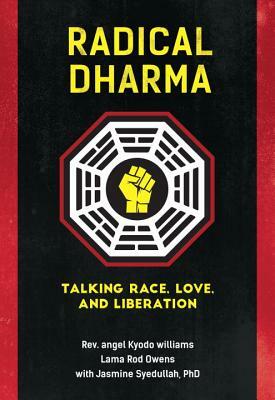 With national attention focused on the recent killings of unarmed black citizens and the response of the Black-centered liberation groups such as Black Lives Matter, Radical Dharma demonstrates how social transformation and personal, spiritual liberation must be articulated and inextricably linked. Rev. angel Kyodo williams, Lama Rod Owens, and Jasmine Syedullah represent a new voice in American Buddhism. Offering their own histories and experiences as illustrations of the types of challenges facing dharma practitioners and teachers who are different from those of the past five decades, they ask how teachings that transcend color, class, and caste are hindered by discrimination and the dynamics of power, shame, and ignorance. Their illuminating argument goes beyond a demand for the equality and inclusion of diverse populations to advancing a new dharma that deconstructs rather than amplifies systems of suffering and prepares us to weigh the shortcomings not only of our own minds but also of our communities. They forge a path toward reconciliation and self-liberation that rests on radical honesty, a common ground where we can drop our need for perfection and propriety and speak as souls. In a society where profit rules, people's value is determined by the color of their skin, and many voices—including queer voices—are silenced, Radical Dharma recasts the concepts of engaged spirituality, social transformation, inclusiveness, and healing. Rev. angel Kyodo williams is an author, activist, master trainer, and founder of the Center for Transformative Change. Her critically acclaimed first book, Being Black: Zen and the Art of Living with Fearlessness and Grace, was hailed as "a classic" by Buddhist pioneer Jack Kornfield. Ordained as a Zen priest, she is one of the only two black women Zen "Senseis" or teachers. In 2011, Lama Rod Owens was authorized as a lama in the Kagyu School of Tibetan Buddhism. He then moved to DC and ran his own center for over two years. Later, he returned to Boston to begin his divinity degree in Buddhist studies at Harvard Divinity School. Jasmine Syedullah holds a PhD in politics with a designated emphasis in feminist studies and history of consciousness from University of California, Santa Cruz, and a BA from Brown University in religious studies with a focus in Buddhist philosophy. Syedullah is currently a Visiting Assistant Professor of Sociology at Vassar College. "African-American and queer Buddhist teachers Rev. angel Kyodo williams and Lama Rod Owens, with Professor Jasmine Syedullah, have brought their brilliant minds and courageous hearts together in their book Radical Dharma: Talking Race, Love, and Liberation (North Atlantic Books). They have also included the voices of other liberation-minded Buddhist practitioners, engaging them in conversations about what it should mean to practice Buddhism while bearing witness to police killings and mass incarcerations of Black people in the U.S. This combination of intersecting identities, talking in trialogue and in face-to-face conversations with complete strangers, makes Radical Dharma an unusual and fierce read."